Since 1987, Pacific Silk Plants has been creating silk plant arrangements nationally, of exceptional quality, design, and style. 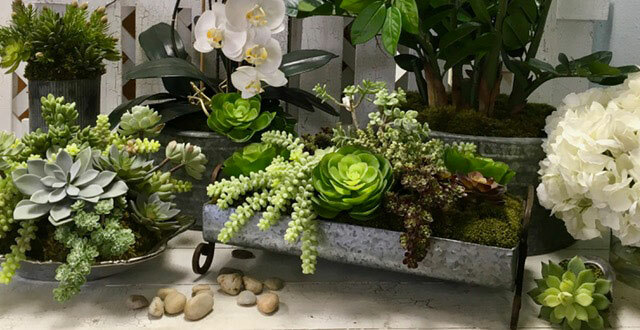 Our company has over 30 years of experience, and uses extensive industry knowledge to source only the best faux flowers, trees, succulents, orchids, and other plants for our valued customers. With fast turnaround times, personalized customer service, and exceptional attention to detail, we are the preferred choice for custom silk flower arrangements amongst interior designers, furniture stores, and discerning homeowners throughout Dana Point, Laguna Niguel, Newport Beach, Irvine, Ladera Ranch, Mission Viejo, and nationwide. When Quality and Style Matter, We Have the Finest Silk Flowers, Succulents & Trees With Experienced In-House Floral Designers. We only have experienced floral designers who can create your special arrangements that will exceed all of your expectations. We use superb techniques, hand-dyed moss, and injected foam to secure each of our handcrafted silk plant arrangements, ensuring that they will stay looking beautiful for years down the line. Many of our loyal customers keep their custom flower and plant arrangements for 20 years or more, and return to us only once they need assistance with a new look for their homes. For Trade Professionals, "It’s Our Job to Make You Look Good." If you are an interior designer, you understand how important it is to provide the highest quality products for your customers. Our job is to make you look good, and we do this by offering a wide array of the finest silk flower, plants, and succulents available, along with a vast assortment of containers in all sizes, colors, and shapes. Our friendly and experienced staff can design and craft the perfect artificial plant and flower arrangements for your needs, whether you have a single tabletop centerpiece or a full turn-key style house. We also offer floral line arrangements for our national customers that can be easily and quickly ordered as needed. Visit our San Juan Capistrano showroom to view our beautiful displays of artificial plants, flowers, succulents, and trees, or call to arrange an on-site consultation. We can ship to anywhere in the continental United States, or provide installation services for trade professionals and qualifying orders. Did you know that Pacific Silk Plants also has a permanent booth at the Las Vegas Market? We are located on the 5th floor of Building C, space #538C. Check out our fresh, sophisticated style with a focus on quality and value! We also offer a wholesale trade program as a courtesy to the trade. "A friend recommended Pacific Silk Plants, they had 3 arrangements done and looked great. I went in the shop and was greeted immediately. After looking around, and taken in their back room to see additional vases/bowls, I had decided to use one of my own pieces as the vessel. The owner (Laura) helped me pick out plants and gave me an estimate. A few days later, I picked up my plant. They stayed within budget and the arrangement looks fantastic, very life-like. They were friendly, helpful and I would have no issue with recommending them."